As case study, I have considered (just for fun) the comparison of my climbing performance in two consecutive editions (2013 and 2014) of the "Tre Valli Bresciane" cycling race. The result is shown (in both cases) in the below figure. The main differences w.r.t. 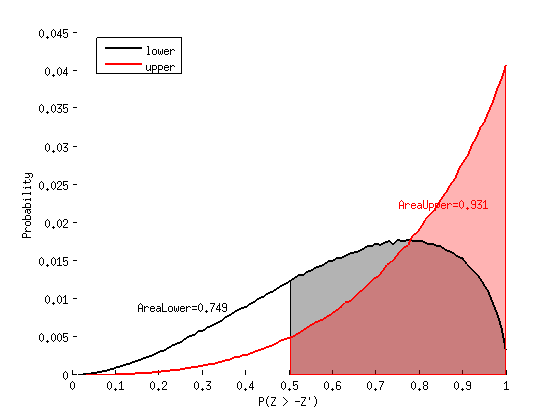 the classical Wilcoxon signed-rank test are: (i) the test is Bayesian and, thus, it returns the posterior probability of the hypothesis "T13 is larger than T14"; (ii) the test is imprecise, which means that it actually returns the lower and upper probabilities of the hypothesis "T13 is larger than T14". Looking at the figure, it can be observed that, since the upper (and, thus, the lower) probability is less than 0.95, we cannot say that "T13 is larger than T14" with posterior probability equal to 1-alpha=0.95. However, the IDP gives us additional information: the posterior probabilities. In fact, since the lower probability is about 0.75, we can actually declare that "T13 is larger than T14" with posterior probability 1-alpha=0.75.